Available in fulltext on The Scorpion Files with permission from the publisher Institut Pasteur d'Algerie. Available in fulltext! Orginally published in the Annals of the Natal Museum, 23 (3), pp. 497 - 784. Available in fulltext on The Scorpion Files with permission from Dr. Bruno Lamoral and the Natal Museum (South Africa). This books is the most comprehensive treatment of Namibian scorpions ever made. Descriptions of the species, identification keys, locality information and very good drawings. The book is written in english. 287 pp. Scorpions of India - Scorpions. Orginally published by The Zoological Survey of India. Available in fulltext thanks to The Zoological Survey of India. This books is the most comprehensive treatment of Indian scorpions ever made, eventhough some of the taxonomy is outdated (many taxa have been revised since the publication of the book). Descriptions of the species, identification keys, locality information and good drawings. The book is written in english. 671 pp. Available in fulltext on The Scorpion Files with permission from the publisher through Peter Wright. Available in fulltext! This volum includes a couple of Herbst's original description of scorpions. This book also includes several beatiful color plates. This book is volum 3 of 16 in the book serial Die Arachniden, written by C. W. Hahn (1-2) and C. L. Koch (3-16). This volum includes several of Koch's original description of arachnids (among them several Euscorpius species). This book includes several beatiful color plates. This book is volum 10 of 16 in the book serial Die Arachniden, written by C. W. Hahn (1-2) and C. L. Koch (3-16). This volum includes several of Koch's original description of arachnids. This book includes several beatiful color plates. Only the scorpion plates are included. Available in fulltext on The Scorpion Files. Available in fulltext! This is only an extract of the book dealing with scorpions! Here you can find the original descriptions of Pandinus bellicosus (described as Heterometrus bellicosus) and Hottentotta minax (described as Buthus minax). A plate with three wonderful drawings is included. On the Classification of Scorpions. Published in The Annals and Magazine of Natural History, Ser. 4, Vol. XVII, pp. 1-15. Available in fulltext! One of Thorell's classic paper on scorpion systematics. Published in Das Tierreich, F. Dahl ed., Friedländer und Sohn Verlag, Berlin, 8: 1-265. The Fauna of British India (including Ceylon and Burma). Arachnida. This is one of Reginald Pocock's book on scorpion taxonomy. The book is written in english. 279 pp. 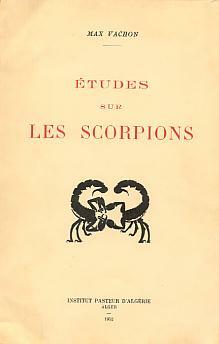 This is one of Reginald Pocock's book on scorpion taxonomy. The book is written in english. 71 pp + 12 plates. Ueber Scorpio maurus Linné und seine Unterarten. Birula's major work on Scorpio maurus and all its subspecies. Orginally published in Horae Societatis Entomologicae Rossicae 39:115-192. Special scans of the plates will be available later. Dr. H. G. Bronns Klassen und Ordnungen des Tierreichs - Scorpiones (5. Band, 8. Buch). Available in fulltext on The Scorpion Files Available in fulltext! This extensive work covers all aspects of scorpion biology. Includes several drawings, but no color plates. Theo Blick, Ambros Hänggi & Konrad Thaler. Checklist of the Arachnids of Germany, Switzerland, Austria, Belgium and the Netherlands (Arachnida: Araneae, Opiliones, Pseudoscorpiones, Scorpiones, Palpigradi). Version 2002 June 1. Available in fulltext (pdf file)! See the homepage for more details about this publication. 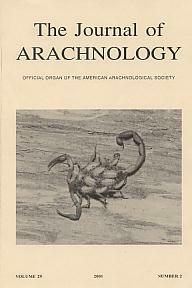 Published by The American Arachnology Society. STING USE IN TWO SPECIES OF PARABUTHUS SCORPIONS. Published in Journal of Arachnology in 1993, vol. 21 (Pp. 60-63). This is a part of my MS-thesis in zoology from the University of Trondheim. The species in the study are Parabuthus liosoma and P. pallidus from Kenya. < a> Bjerke, R., Lundheim, R., Rein, J.O., Strømme, J. A. & Zachariassen, K. E.
Water balance and osmotic regulation of the East African scorpion Lychas burdoi (Simon). Published in 1989 in Fauna Norv. Ser. B, 36: Pp. 33-36. This study investigate the water balance and osmotic regulation of L. burdoi, which inhabits dry areas in Kenya. Ken Dittrich, MD, FRCP(C); Anthony P. Power, MB, MCGP(Ir); Norman A. Smith, MD, FRCP(C). SCORPION STING SYNDROME - A TEN YEAR EXPERIENCE . Published in The Annals of Saudi Medicine in 1995, vol. 15(2) (Pp. 148-155). A 10-year retrospective review was undertaken of patients presenting with scorpion sting to the Emergency Department of the King Fahad National Guard Hospital in Riyadh. Gajanan Gajre, MBBS, FRCP, DCH; Ali S. Dammas, MDDCH, Fachartz. SCORPION ENVENOMATION IN CHILDREN: SHOULD ALL STINGS BE GIVEN ANTIVENOM? Published in The Annals of Saudi Medicine in 1999, vol. 19 (Pp. 444-?). A study on the advantages and disadvantages in using antivenom to treat scorpion sting in children. Philip H. Brownell & J. Leo van Hemmen. How the Sand Scorpion Locates Its Prey. Published in APS March 2000 Meeting, Minneapolis . A study on how the Sand Scorpion, Smeringurus mesaensis, is able to locate prey through vibrations in the substrate. Description of a new species of Ananteris (Scorpiones, Buthidae) from the south of French Guyana. Published in Zoosystema in 2001 (Vol. 23(4), pp. 689-693). Description of a new species of Ananteris. Kleber, J. J. et al. Published in Deutsches Ärzeblatt in 1999 (Vol. 26(25), pp. A-1710-A-1715). A review article about the medical significance of scorpions, and the treatment of serious cases. In german.